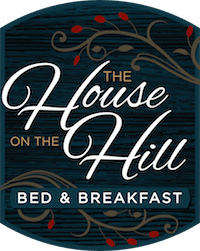 Happy New Year from The House on the Hill Bed and Breakfast! Winter is upon us with a force in Northern Michigan, and as a business, it’s time to get creative. Do you fall under the title of hibernator or adventurer in the winter? Or both? I could easily curl up with a good book and cocoa and let the wind rattle outside without me. But, I do love to romp outside in my snowshoes and embrace winter as well. I received the best Christmas gift this year. 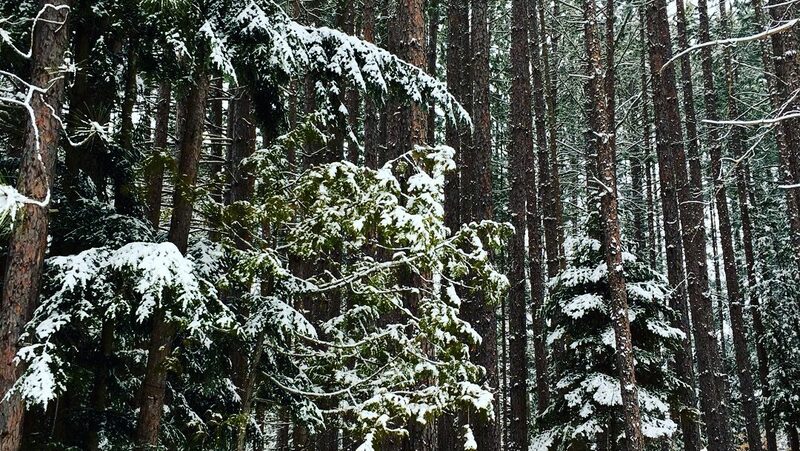 Since our B & B is on 53 acres of land, I snowshoe quite a bit. Under the Christmas tree was a new pair of snowshoes that are made of a foam material. They are super lightweight so I can run in them! Pretty awesome! Check them out. As a business owner, I know that even when business is slower as it inevitably is in the winter, I need to keep the ideas flowing. Recently my daughter had a baby in Manhattan, New York. My husband took this picture of me multitasking. I can’t think of a better way to work, than with this little precious one in my arms! Even the dog was comfortable with it. Coming up with new recipes to test over the winter is my goal right now. I have a test kitchen day every week in the winter. This cures my restless nature to be able to have great recipes tested before the heavy season starts. In this edition, I would like to share a Frittata recipe that is so tasty and easy. You can either do individual frittatas or make one large one. This recipe is for an individual frittata that is perfect for one person. I like to make these on the days where I have a smaller group here at the B & B. I have these great 4 inch mini skillets that work well for this recipe. If you don’t have anything that would be suitable for an individual frittata, just double or triple the recipe for larger skillets. For a little decadence, I whip ricotta with sea salt and heavy cream and put a dollop on the top and sprinkle with herbs. Enjoy! 1 tsp. chopped fresh herbs (I typically use basil or chives, but it can be any herb. Preheat oven to 375 degrees Fahrenheit. Whisk together all ingredients until smooth. Put a pad of butter in the skillet and heat in the oven until melted. Once melted, turn your pan so the butter coats as much of the pan as possible. Pour the egg mixture into the skillet and bake uncovered for 12 minutes. The frittata is ready when a toothpick comes out clean. 1/2 tsp. Heavy cream (start off with 1/2 tsp and add a little more if needed to get to a creamy consistency). Remove frittata from the skillet onto the plate and top with whipped ricotta and herbs. The House on the Hill Bed and Breakfast (Ellsworth)-If you are a guest, enjoy 53 acres of private land and free snowshoes offered to you. With hills and valleys, the views are beautiful. When you come out of the cold to warm up, you will enjoy a spacious room and a Guest Center stocked with hot cocoa, coffee and warm baked cookies. Wake up to a three course breakfast in the morning. Bay View Wine Trail (Petoskey)- There are nine wineries in the Petoskey area that allow you to snowshoe on their property. Bonobo Winery on Old Mission Peninsula (Traverse City) – Enjoy beautiful trails on the Bonobo property. After your snowshoe adventure, come into their beautiful building and do a wine tasting! Antrim Creek Natural Area (Atwood) – Beautiful trails along the Lake Michigan shoreline. Mt. McSauba (Charlevoix) – Beautiful dunes and trails along Lake Michigan. Every Friday at 5:30 p.m., there is a lighted night snowshoe trail open to the public. If you want to get a deal when you come to Northern Michigan for your snowshoe hike, or just to shake your winter blues, here’s your chance! Four weekends to buy one night and get one night free. Get out of your kitchen and let me cook breakfast for you! Previous StoryTop Five Northern Michigan Towns to Visit for the Holiday Season, Tuscan Strata Recipe, and a BOGO! Next StoryTop Eight Restaurants in Northwest Michigan for Valentine’s Weekend, A Fruit Dutch Baby Recipe, and Two BOGO Weekends Left!